In a season jam-packed with guest appearances and one-off characters, from visiting stars like Hank Scorpio and The Space Coyote to Simpsons regulars voicing Belle and Frank Grimes, “The Old Man And The Lisa” keeps it simple. It’s one story throwing together Lisa Simpson and C. Montgomery Burns. Playing Springfield’s most principled second-grader against its ruthless tycoon lets the show stick close to home, showcasing the characters we know and love—or, in the case of Mr. Burns, the character we know. At first, the magnate of atom smashing and the ardent do-gooder are on opposite sides. When Burns speaks to Springfield Elementary’s Junior Achievers Club, he extols the virtue of eschewing family, religion, and friendship to achieve success. (“When opportunity knocks, you don’t want to be driving to the maternity hospital or sitting in some phony-baloney church… or synagogue,” he adds, in a grudging concession to inclusiveness.) Lisa, who’s been busily collecting refuse to fund the club’s trip to Albany, flummoxes him by asking if the nuclear power plant has a recycling program. He doesn’t have an answer; he doesn’t even understand the question. (Monty Burns’ lexicon, scanning his memory from ragamuffin to ruthless: ragamuffin, rah-rah, raid, rancid, rancor, rattlesnake, reap, redskin, reign, reign of terror, relic, repugnant, rogue, Rottweiler, rotund, running dog, rutabaga, ruthless. Recycling isn’t in there.) Lisa teaches him both the word and the concept of conserving natural resources, spurring Mr. Burns to righteous indignation. “Oh, so Mother Nature needs a favor? Well, maybe she should have thought of that when she was besetting us with droughts and floods and poison monkeys!” He declares nature his enemy, and after a career surrounding himself with yes-men, he presumes she’ll agree. Lisa’s no jolts him, and so does her revelation that his great fortune has diminished—which is odd, since she cites Will There Ever Be A Rainbow, the autobiography Burns wrote in “Blood Feud.” Those yes-men have let him fritter away his riches ever since he stopped checking the stock ticker in September, 1929, and soon he’s penniless. Despite an aggressive trading strategy to stanch the losses, soon the bank forecloses on his plant and mansion (no word on the hounds), leaving him to rely on the kindness of Smithers. It should be challenging to gin up sympathy for C. Montgomery Burns, despoiler of nature, releaser of hounds, shutter-up of little girls, but “The Old Man And The Lisa” does it deftly without ever betraying his character. Stripped of the comfort and power of wealth, he’s no longer the fearsome titan of industry, but a frail man in a baffling world, doggedly trying to make sense of his new surroundings. His zeal is misguided but winning, and the commentary track points out that the animation contributes to Mr. Burns’ appeal by drawing him without his usual scowl. It’s his muttering over the catsup bottle (and the ketchup bottle) that does him in. Concluding that sudden penury unbalanced Burns’ mind, the grocers have him committed (“Are you here to solve my catsup problem?”) and Chief Wiggum hauls him off to Springfield Retirement Castle, where he and Lisa cross paths again. Eager to pass the time and build a new fortune, he pleads for her help. He’s had it with yes-men, and Lisa’s frank rejection of his values only makes him more determined to recruit her. “The Old Man And The Lisa” hinges on the dynamic between these two familiar characters, and the episode builds their relationship gradually and plausibly, from antagonism to mutual appreciation to the final revelation that their goals—their essential selves, really—are deeply incompatible. Lisa’s conscientious, but she’s not perfect, and she can’t resist taking some small pleasure in Burns’ downfall. She doesn’t relent until he begs on his knees for her help. No one’s sugarcoated in this episode: not Lisa, not Burns, and not the populace of Springfield, who relish the thought of C. Montgomery Burns picking up trash for a living. Marge, Homer, and Bart join in the gloating, and why wouldn’t they? As Kent Brockman’s human interest story points out, he’s “the man who blocked out our sun, ran over a local boy, and stole Christmas from 1981 to 1985.” It’s hard to believe such a villain would commit to rebuilding his empire through “good, socially responsible things, nothing evil,” but Lisa believes in him. And so does Mr. Burns. 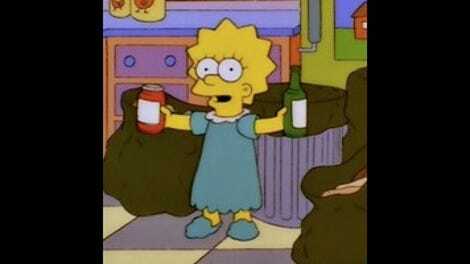 That’s the tragedy, and the comedy, of “The Old Man And The Lisa.” Lisa recycles to preserve nature. Monty Burns says “hard cheese” to nature; he recycles because there’s good money in garbage. Intent isn’t everything, but outlook can be, and when Mr. Burns finally gathers the resources to execute his master plan, his grasping, voracious nature shapes his understanding of Lisa’s teachings. The value of harvesting waste and using every scrap blossoms in his fertile imagination, while her lessons on the virtue of unspoiled nature wither away. Lisa defends him against her family’s gibes, telling them, “Mr. Burns has changed. He’s different now.” But he hasn’t, and he isn’t. Nature will out, and Burns’ nature leads him inexorably in the same direction every time. 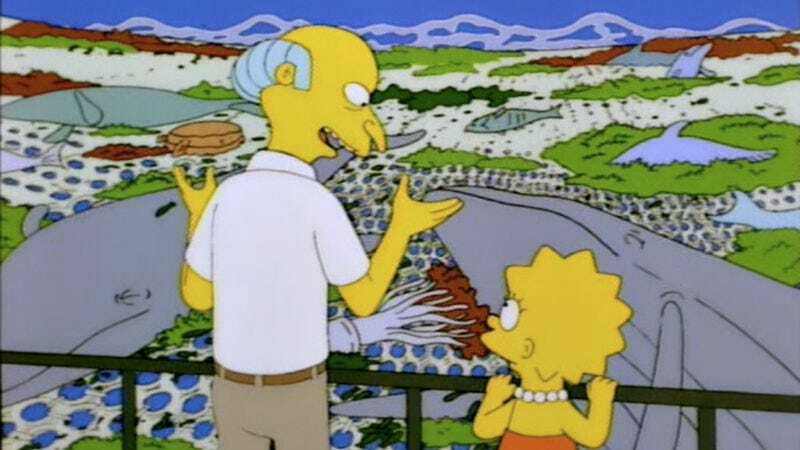 Taking Lisa on a tour of his newly founded Li’l Lisa Recycling Plant, Mr. Burns beams with pride, and he’s mystified by her revulsion over The Burns Omni-Net, which “sweeps the sea clean” with a vast net of crafted from a million six-pack holders. “I couldn’t watch your demonstration of the fish caught in the plastic rings without getting an idea,” he tells her, and that’s the heart of the episode: Where Lisa sees a trap, Burns sees an advantage, and he can’t imagine seeing it any other way. It’s not that Mr. Burns is innately evil (though he is, oh, he is), but that even when striving toward social responsibility, he follows his impulse to wring every drop of profit from everything he touches, including nature. He dutifully absorbs her instruction and twists it with terrible efficiency into a massive engine of environmental devastation, one with Lisa’s face on every label. Like the Burns Omni-Net, the single story of this episode is an ingenious idea wrested from simplicity. It mingles two characters’ well-established traits—Lisa’s earnest, didactic nature (what Burns calls “her infectious moralizing”) and Mr. Burns’ facility for unfettered exploitation—and plays out the notion to its logical, horrible end. Spinning its central conceit from a few familiar, fundamental elements of The Simpsons, “The Old Man And The Lisa” helps to ground a season full of excursions and departures, bringing the story home while still telling a tale of exciting scope and honest sentiment. This week in Simpsons signage: Uriah’s Heap Recycling Center. Every time I mutter over the ever-expanding choices and changes of the supermarket, I think of Mr. Burns, and especially of his wistful “But I’m shopping…” as they take him away. On the commentary track, the writers give a shout-out to Tomi Yamaguchi (IMDB credits him as Tomihiro Yamaguchi), the animator who drew every one of those six-pack circles by hand. Next week: Erik Adams is gonna stuff you full of “In Marge We Trust” ’til you don’t know what’s what!